★ Halloween costume graphics with the lower case letters of the alphabet match up to other Halloween costume graphics with the upper case letters. ★ Numbers 1-20 to arrange in order as well. ★ Optional recording sheets for students to write the alphabet and the numbers. ★ 6 Different Spooktacular Award Certificates at various levels. Halloween Build A Word Wheels – Set 1 – Different Ways To Use and Record – 63 Different Combinations of Wheels, so you can make 63 Word Builder Wheels with this set! – Includes 4 Word Builder Awards and 8 Recording Sheets – Great for Differentiating Word Building Practice with your students – 7 inner wheels and 9 outer wheels. Halloween Candy Corn Compound Words Puzzles – 96 Compound Words – Self Correcting! Answer keys, 4 optional recording sheets and 4 awards are included. 1 blank set of candy corn puzzles and answer cards in case you’d like to make some additional compound words you need. Halloween Counting and Skip Counting Activities – 30 Page Download – 60 Different Trick or Treaters make this activity perfect for a Halloween review of counting and skip counting by ones, twos, fives and tens to 100. Easy Assembly – 12 books in all-8 Pages Per Book – Use for guided reading, and send home for extra practice. Halloween Sight Words Literacy Centers Game Board Activities – 5 Different Game Boards Set 1 – All Halloween Themed – Contains spinners, gameboards, recording sheets, and awards. This file contains 5 different Halloween game boards for the first 100 Dolch sight vocabulary words. I have included 6 spinners. Halloween Sight Word Literacy Centers Gameboard Activities – 5 Different Games – Set 2 – Last 120 Dolch Sight Words – This file contains 5 different gameboards for the last 109 Dolch sight vocabulary words. (First 111 Dolch words are on Set 1). Spinners, Gameboards, Recording Sheets, and Awards. Halloween Sight Word Activities Ghost BOOsters! – Level 1 – First 100 Dolch Words – Memory and Ghost BOOsters Card Game – 10 Sets – 5 Ways to Play – 55 page download – First 100 Dolch Words. (See set 2 in my other product listings for the last 120 Dolch Words.) You can print it out as is, but it is designed to be printed out back to back with 10 different sets of HALLOWEEN graphics printing on the reverse side to keep the 10 sets separate. Optional recording sheets with matching graphics and 4 Ghost-BOOsters Awards. 23 Page Download – 48 Contractions – 4 different sets with 12 different pairs in each set. Students match contractions to the words from which they are made. Halloween Spook-tacular Synonyms Literacy Centers – Recording Sheets & Award (60 pairs of synonyms) and 60 Trick or Treaters in different costumes match up to Halloween houses for trick or treat! 4 Ways to Play -29 page download – 120 Words – 5 complete sets with different backings and print color to keep them separate. Halloween Trick or Treat Onset Rime DIBELS Literacy Center Activities – Level 1 – Match each Trick or Treater to a Halloween House to make a word… Real or Nonsense? Prints nicely in color or grayscale. All c-v-c words and some cc-v-c words, but you do not have to use the consonant digraphs for onsets. 23 Page Download – 3 Ways to Play – 24 different Trick or Treaters with onsets (beginning sounds and digraphs) match up to a variety of Halloween houses with rimes (–at, -ip, um, ed, ot, etc.). Optional recording sheets for students to write the cvc onset rime words they form. Play as a simple pick a Trick or Treater and match it to a Halloween House with a rime that forms a word. OR play “Real or Nonsense?” Trick or Treater onset cards can be placed in a decorated copy paper lid (Halloween scenery for sides inside and out provided). I have a Level 2 Version that you can find in my products listings. It can be added to set one gradually to make the activity more difficult and differentiate students’ practice. Onset Rime – Match each Trick or Treater to a Halloween House to make a word… Real or Nonsense? 48 onsets and 84 rimes- Prints nicely in color or grayscale. 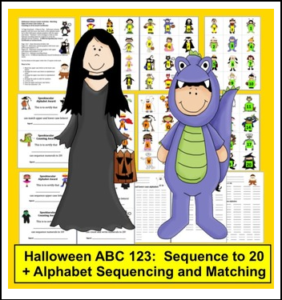 34 Page Download – 3 Ways to Play – 48 different Trick or Treaters with onsets (beginning sounds, digraphs, blends and trigraphs) match up to a variety of Halloween houses with more complex rimes than in set 1 (–ear, -ight, ain, eat, end, etc.). Optional recording sheets for students to write the words they form. Play as a simple pick a Trick or Treater and match it to a Halloween House with a rime that forms a word. OR play “Real or Nonsense?” Trick or Treater onset cards can be placed in a decorated copy paper lid (Halloween scenery for sides inside and out provided). I have a Level 1 Version (a smaller file and only $2.95) that you can find in my products listings. It can be combined with this set to make it easier for students who have a difficult time with this level. It contains just short vowel c-v-c words. Adding this set will allow you to truly differentiate.